Acon Digital DeFilter by Acon Digital is a Virtual Effect Audio Plugin. It functions as a VST Plugin, an Audio Units Plugin and an AAX Plugin. 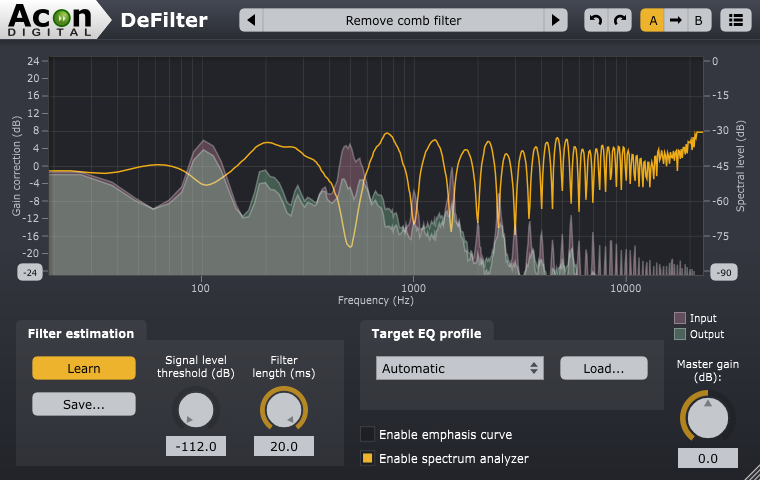 DeFilter is an efficient tool to even out tonal imbalances in a mix or reduce resonant peaks or dips in the frequency spectrum. Even severe issues such as comb filter effects or standing waves from untreated rooms can be addressed. DeFilter can match recordings to target profiles such as music or speech, or alternatively extract the overall timbre from the source – the large strokes – while evening out narrow peaks and dips. The latter removes resonances and comb filter effects effectively while preserving the tonal character of the input signal. 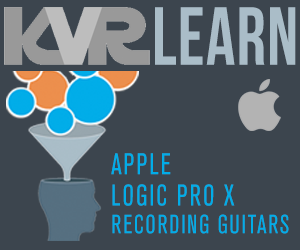 Recordings can also be equalized to match a reference recording. Fix issues in a mix prior to mastering. Reduce resonances caused by untreated room acoustics. Matched equalization (automatic equalization based on a reference signal). Improve clarity and intelligibility of speech. Instant fix for nasty comb filter effects. Acon Digital DeFilter is available for both Windows (PC) and OS X (Macintosh). Both 32 and 64-bit versions are available, and the plug-in formats VST, AAX and Audio Units (OS X only) are supported.